I remember when I was pregnant with our now 22-year-old son Joshua. I was planning on quitting my job and staying home which would require cutting corners everywhere possible. To help our budget I took the plunge into the wild, unknown world of cloth diapers and got a real education. I loved it. Okay, I loved the fact I was saving us money. I did not love the fact that every time I washed the diapers I needed to open the windows and cut on the whole house fan even in the dead of winter. Y’all, it was bad. Since my daughter Rachel had my first grandchild I am amazed at how things have changed in the diaper world! No more accidentally sticking the baby with diaper pins or using plastic pants three sizes too big. Here’s Rachel to tell y’all about the joys of cloth diapering in 2015! Rachel: I distinctly remember the first time I gave a thought to cloth diapers – and that thought was “NO WAY”! My mom mentioned it in a joking yet underlying serious way and all I could think about was the dreaded dunk and swish of poop in the toilet. WHY would I want to have any extra contact with baby poop? Wiping dirty tushies was more than enough for me! I let the idea go in one ear and out the other with a quickness. 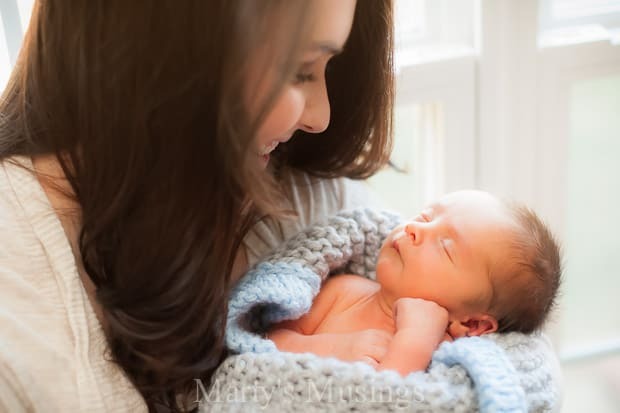 A few weeks later and well into my second trimester my husband and I were having to have the tough conversations about what our finances would be like after our baby was here and how much I would need to work to help keep our household afloat. I could hear my mom’s voice in the back of my head saying, “you know cloth diapers will save you a lot of money. Disposables are so expensive.” I sat down at the computer and started crunching numbers and doing research and realized it would help give us a little cushion in our budget if we chose the cloth diaper path. Donny was 100% against it from the second it came out of my mouth. Quite honestly I felt he didn’t get much of a say because the man had never changed a diaper in his whole life! It wasn’t until we had gotten into the routine of diaper laundry and he realized they are WAY less complicated than his (and my) preconceived notions that he came around. Now, seven months into our cloth diaper journey, we both love it! I waited until we introduced regular foods to our little man before writing my top five tips because my biggest fear was my mindset would change during this phase. Good news! It hasn’t! During my pregnancy I became VERY overwhelmed by the dozens of brands to choose from, different wash routines, and opinions coming from every angle. I remember my mom kept asking me which ones I wanted so she could buy some for us and my response? I don’t care, you choose! 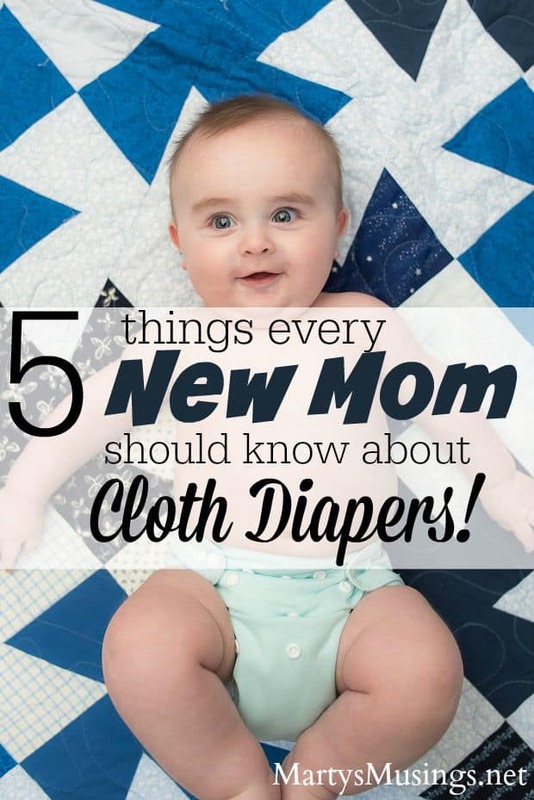 Looking back, these are the 5 things every new mom should know about cloth diapers! I know this sounds so silly, but really – don’t! Cloth diapers have come a LONG way from dish towels and metal pins wrapped sumo wrestler style. Before Aiden was here I was so fearful I wouldn’t wash my diapers correctly, I wouldn’t be able to keep up with the laundry, my baby’s skin would react poorly, the smell would fill our whole house, or it would just plain and simple be more then I could handle. In reality, it was SO much easier then I ever thought it would be. The learning curve is small and the rewards far outweigh the inconveniences. Become very familiar with fluffloveuniversity.com. A friend of mine sent me the link to their website and invited me to join their Facebook support group and I was hooked! It was a complete life saver when I was trying to figure out all the different types of diapers and what a good wash routine looked like. I honestly feel this website should be labeled “cloth diapering for dummies.” The support group has been really neat, too, because you can post a question or a problem you are having (leaks, smells, rashes, etc) and you will have a host of different responses from people with real life experience! I know you just reread that sentence, didn’t you? I’m serious! I choose to use disposables at night or if we are going to be out for several hours on end. I have found it is worth it to ensure that my baby will get the 10 hours of sleep he needs and not be woken up from wet pjs! You know that phrase “if Momma ain’t happy, ain’t nobody happy?” Well, if Momma ain’t rested, ain’t nobody gonna be happy! So disposables at night it is. Leave your diaper pail open. This blew my mind. I think I texted my cousin that same question on three different occasions because I just couldn’t understand how leaving the lid off our diaper pail could help – shouldn’t we be clamping that thing shut with metal clips?! But she was right! I have found that allowing each diaper to air dry decreases the stench (and if you keep the pail in the bathroom like us then that’s another step to make sure you decrease the odds of any unpleasant stank wafting your way). These bad boys are a life.saver.for.real. We started using these when Aiden began eating baby food. They look like dryer sheets that lay down inside the cloth diaper and act as the most perfect poop catcher! Just lift out and toss and you COMPLETELY skip the dunk, swish, and vomit steps. Side note – if you are exclusively breast feeding your baby, no need to worry about the dirty diapers until you are introducing real foods – those messes are water soluble and can be thrown straight into the washing machine! Score! I can now add cloth diapers to the list of things on my “My Mom was right” list! Also, just for grins I’ve listed below the 5 reasons you should use cloth diapers, too. 4) They save ALOT of money. 5) They are good for the environment. Marty (proud mom and Nana): Can I just tell you how satisfying it is to hear how “right” I am after so many years? I am lovin’ this stage of life! 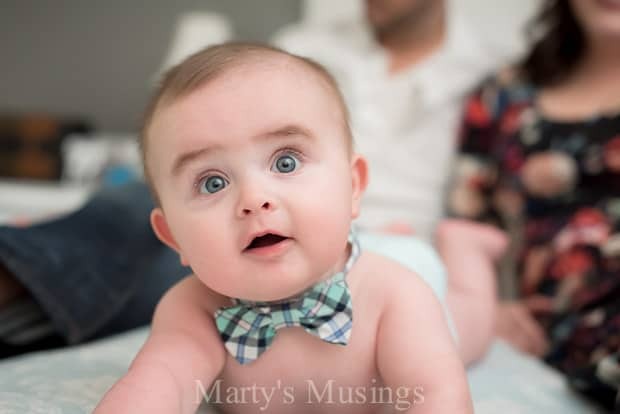 I have a beautiful grandson and apparently I’ve gotten smarter, all at the same time! Since I keep Aiden every Thursday I can testify to the ease of these diapers. They have indeed come a long way from the baggy ones with plastic covers I used 20 years ago! Here are Rachel’s cloth diaper recommendations with links. 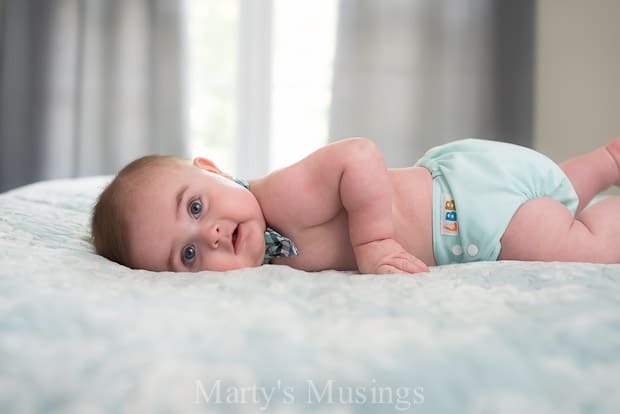 We used cloth diapers and it was SO easy and saved us SO much money! It wasn’t even a big deal to use them when we traveled or camped – the only time we had to use disposables was when we’d be camping in a tent for a month in the summer. I also think they help speed potty training – our daughter turned 2 and basically potty trained herself! Hi, Lisa. My daughter will be excited to hear the cloth diapers speed up potty training! At nine months my grandson isn’t anywhere near it but I know she’d like some hope down the road! Have a blessed day! I am cloth diapering for the second time with my 3rd child. I did it to save money, and you just can’t knock the cuteness. Once you get into the swing of things, it is not much more onerous than disposables, but we always keep some disposables on hand for emergency reasons. Hi, Kelley. Cloth diapers are way cuter than they were when I used them 20 years ago but the money factor is still such a part of the decision. Congrats on your 3 kids! Congratulations on your 4 children! Cloth diapering is such a wise choice! We are all about cloth in our family and currently using the same cloth diapers that we did on baby one, with baby two! Good for you, Stasia! The cloth diapers available now are amazing! We save a ton of money using cloth diapers at home. I’m with you, though, at night and when we are out and about for a long time, we use disposables. So true! I use disposables at night too and on vacation. We also leave the diaper pail open and it makes a huge difference in smell! I got some disposable liners but never used them, I am on my second baby and still haven’t used it lol! My kids never pooped on a schedule so I just didn’t find them practical. I should start though. What are your fav brands? What a great article. I have 4 kids and I never did get the chance to use cloth diapers. More or less I hadnt heard about them or there has been more of an uptick recently in their use and benefits. I wish I knew more back then than I do now! Maybe one day if we have another little one I will get the chance to try the cloth route! Thank you for sharing with us at #ThrowbackThurday we hope to see you again this week. Hi, Alli. I used cloth diapers over 20 years ago and they certainly have changed. I’m glad my daughter decided to use them because they are easier and sure are cuter!